YARN is Yet Another Resource Negotiator. 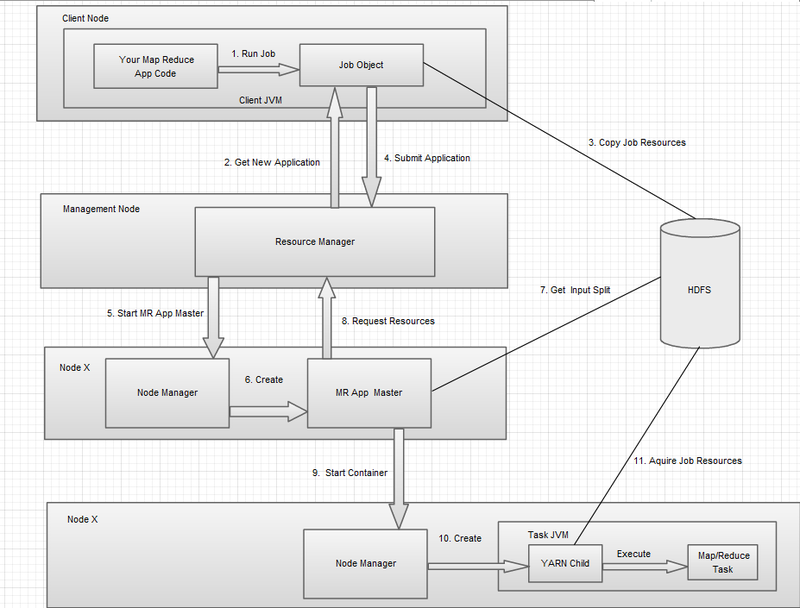 Clients submit MapReduce job by interacting with Job objects, clients runs in its own JVM. Job’s code interact with Resource Manager to acquire application metadata such as application id. Job’s code move all job related resources to HDFS to make them available for rest of the job. Job’s code submits the application to Resource Manager. Resource Manager choses a Node manager with available resources and requests a container for MRAppMaster. MRAppMaster grabs required resources from HDFS, such as input splits; these resources were copied in step 3. MRAppMaster negotiates with Resource Manager for available resources; Resource Manager will select Node Manager that has the most resources. MRAppMaster tells selected NodeManager to start Map and Reduce tasks. Node Manager creates YARN Child containers that will coordinate and run tasks. YARN Child acquires job resources from HDFS that will be required to execute Map and Reduce tasks. YARN Child executes Map and Reduce Tasks.